What a better way to spend a hot summer day than hiking under the canopy of lush green trees to a have a picnic at the foot of a waterfall? 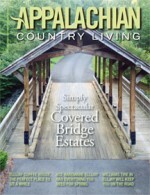 Beautiful summer foliage and mountainous terrain provide the backdrop to explore the gorgeous north Georgia waterfalls for the casual day-tripper or for the avid hiker. The most accessible waterfall in the area is also the most superlative. Amicalola Falls State Park boasts the tallest cascading waterfall east of the Mississippi River. At 729 feet, Amicalola Falls is a must see for all waterfall explorers. These falls are stroller/wheelchair accessible, yet adventure stems from this park to satisfy even the most wild at heart, as the Appalachian Trail approach begins here and can be followed from the north Georgia mountains all the way to the heart of Maine. Be sure and stop by the visitor’s center to see the equipment used by Gene Espy, the second person to thru hike the entire Appalachian Trail. Some may want to take the five-mile hike to the back-country Len Foote Hike Inn (open all year, reservations required) to get away from it all. Yet everyone will want to visit the beautiful Amicalola Falls Lodge with its panoramic view of the mountains, lovely accommodations and tasty buffet restaurant. However it’s the Amicalola waterfall that is the crowning jewel. Accessing the Three Forks area via Forest Service 58, the vistas of Noontootla Creek beacon you to roll the windows down, slow your pace and take in the splendor. It’s the kind of drive where you’ll be tempted to stick your head out the window and grin ‘till you get bugs in your teeth. It’s that beautiful. Park where the Appalachian Trail and the Benton Makaye Trail cross the road and head north. Just 9/10 of a mile through some of the prettiest hemlock forest that still survives in the Appalachians; take the spur trail to Long Creek Falls at the divergence of the AT and BMT trails. The cool mist and feeling of sanctuary envelops you as you stand at the foot of this broad majestic fall in the company of the towering hemlocks. Near Cherry Log, GA take Rock Creek Road 9/10 of a mile past the abrupt Stanley Gap. Park and walk north up the Benton Makaye Trail 400 yards to Fall Branch Falls. This is a 60-foot fall in multiple drops. Just the drive out Rock Creek Road is delightful—that gorgeous mountain dominating the landscape to your right over the pastures is Cold Mountain in the Rich Mountain Wildlife Management Area. Visitors and locals alike enjoy spending a hot summer day with their toes in the cool mountain water. Feeling a bit more adventurous? Explore the Cohutta Wilderness Area by hiking the Jacks River Trail via Old Hwy 2 to Forest Service 22 at Dally Gap. This is surely one of the most beautiful mountain stream environments in all of Appalachia. This challenging 15.7-mile trail crosses the river 37 times– the first four crossings from Dally Gap are spectacular. Keep your eyes open for crawdads, salamanders, red tailed hawks, wild boars and black bears; all of these and many more creatures call this remote region home. If you want to set your sights on Jacks River Falls, enter from the north off of Big Frog Road/Forest Service 62 just over the Tennessee state line. Drop down the Beech Bottom Trail 3.9 miles and hang a right on the Jacks River Trail to the falls. This is a challenging trail into a remote wilderness area. Take all necessary precautions and provisions. Jacks River features multiple falls and a powerful volume of water. Another great water trail is the Emory Creek Trail. Travel Hwy 52 West out of Ellijay, then turn right and follow Conasauga Lake Road to Forest Service 18 to the Holly Creek parking area. It takes about an hour to walk up to the falls, crossing the creek 12 times. You must cross over Bear and Emory Creeks at their convergence into Holly Creek and follow the trail ever upstream. The reward is great for those who persevere, as there are several falls of note here. The first is 60 feet tall! Get some tips from the local outfitter’s store before heading out on this one, and don’t forget to pack your hammock. There’s a great place to string it up at the base of the second fall. We hope these suggestions may be just enough to whet your appetite for exploring north Georgia’s waterfalls. You’ll want to allow plenty of time for driving to any of these destinations, as the journey is so much a part of the fun. 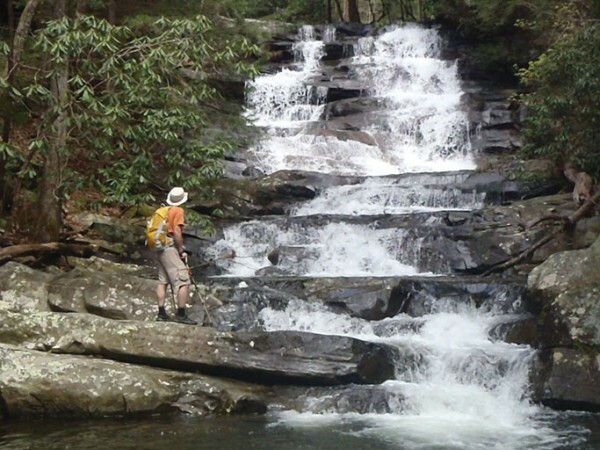 If you’re hiking Jacks River or Emory Creek, you’ll need some shoes you can tread through the streams and keep on hiking. Be sure they have sticky tread and toe protection. Trekking poles or at least a sturdy hiking stick are a must for stream crossings. Rain protection, insect/tic repellant, plenty of water and snacks are also in order. A trash bag should be on your list to help keep these areas pristine for us all. And don’t forget to bring your camera to capture a lasting summer memory. Just pondering these waterfall hikes brings up images of Lewis and Clark charting the glorious unknown, sublime. For maps and directions please visit one of our local Chambers of Commerce.